As any cursory read of these pages shows, I love Spain. I love the country, the people, the history, the culture, the food and the wine. Spain is simply one of the most exciting wine producing countries there is. The whole country is awash with wine. 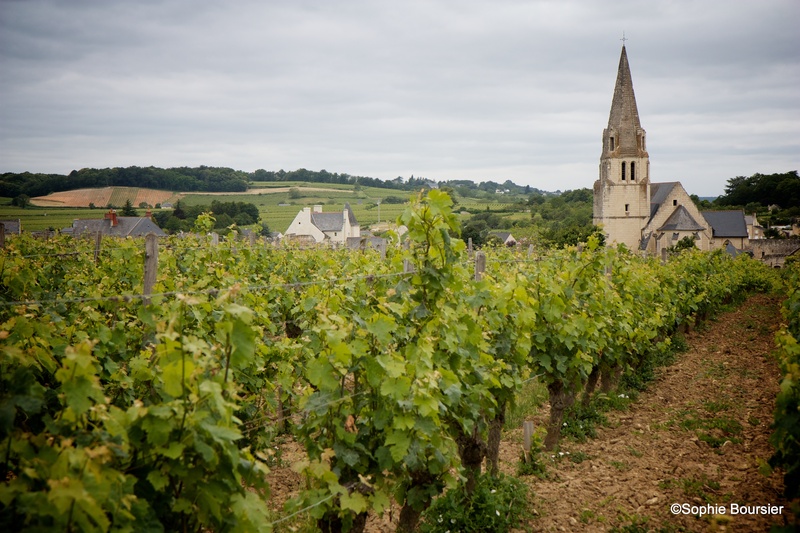 It is the third largest wine producing country in the world, after France and Italy, but has the largest vineyard plantings of any country on earth. In the UK we do not give Spain the respect it deserves, Spanish wine is incredibly varied and diverse, but apparently most of us really only drink Rioja and a bit of cheap Cava. That is a shame as there is so much more going on in this wonderful and colourful country – dip into these pages and you will find a great deal about Spanish wine, food and travel. Recently I attended a most fabulous event. It was a tasting hosted by Bodegas Bilbainas and it was an evening to remember. Bilbainas are an old Rioja house, founded in 1904 and now owned by Catalan Cava producers Codorníu. It has always been a good house, but seems to have become even better of late. Unusually for a Rioja producer Bodegas Bilbainas have always owned a lot of vineyards, 250 hectares near Haro in Rioja Alta in fact. This is why they label their wines Viña Pomal – Pomal being the name of this estate, as they only make estate wines. The event was held at the elegant Hispania restaurant in London’s Lombard Street and I have seldom been anywhere so civilised and comfortable. The service was perfect and the food set the wines off perfectly. I tasted a glorious array of wines, all of which were superb, and I will write about them soon, but with winter fast approaching I thought that I would tell you about a really fine red. A map of Rioja – click for a larger view. Gran Reservas are traditionally thought to be the best wines of Rioja and are only made in the very best vintages and were pretty rare when I was young. Such vintages come along much more frequently today – so you see global warming is not all bad! 2010 was a really great vintage, rated Excellente, and the quality shows. Most Rioja blends Tempranillo with a little Garnacha / Grenache and possibly a dash of Mazuelo (aka Carignan) and the much more rare Graciano. This wine is just 90% Tempranillo and 10% Graciano and is aged for 12 months in American oak barrels – American oak gives that vanilla character – before being racked, blended and returned to barrel for another year. After that the wine is transferred to wooden vats to fall bright, bottled and aged in bottle for a further three years before going on sale. Viña Pomal is an old, but very strong brand. I sat with this wine, as I had an array of 4 or 5 others to distract me, and I am so glad as it really developed in the glass. It is undeniably pretty with loads of deep red fruit, vanilla, cloves and a light dusting of vanilla, coconut, tobacco and leather, as well as a note of cream. The palate was supple, silky and refined. Just nudging full-bodied it elegantly filled my senses and my palate with rich fruit, but also those classic, mineral, savoury, spicy and balsamic sensations that make Rioja so moreish. The tannins give a light bite while the acidity gives a nice touch of freshness. This is a brilliant wine. It delivers so much and promises so much too. It is absolutely delicious right now, but will happily age for another decade, and become more savoury and complex – although some of that fruit will fade. It is bright and wonderfully youthful with great structure and real elegance – 93/100 points. A wine like this is very versatile and would be fabulous with Christmas dinner, but is equally great with any meat dish, or even cheese. This wine is strangely difficult to buy, but can be ordered online from Vinum.co.uk and the equally fine 2011 vintage from Decantalo.com, Uvinum.co.uk and Exel Wines. 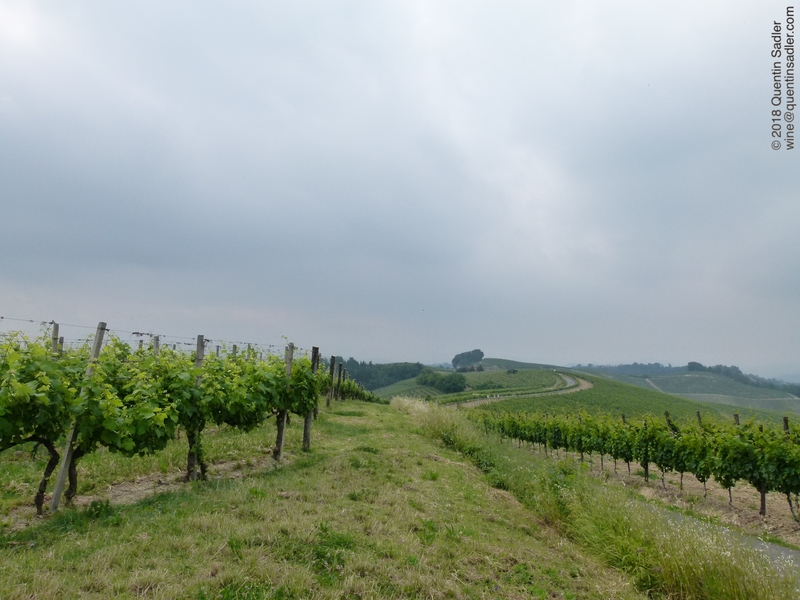 The beautiful landscape of Monferrato. Albarossa! Yes my wine of the Week – or indeed last couple of months as I have not been able to write very much of late due to personal circumstances – is made from the Albarossa grape. I love discovering wines, regions and grape varieties that are new to me and this was a revelation. Albarossa has a rather muddled history and is not widely used for anything – but on the showing of this one that I tasted recently – it really should. It is a black grape bred in 1938 by Giovanni Dalmasso in Conegliano, the heart of Prosecco country today. He had intended to cross Nebbiolo and Barber – which both blend together rather splendidly in the Langhe region of Piemonte. 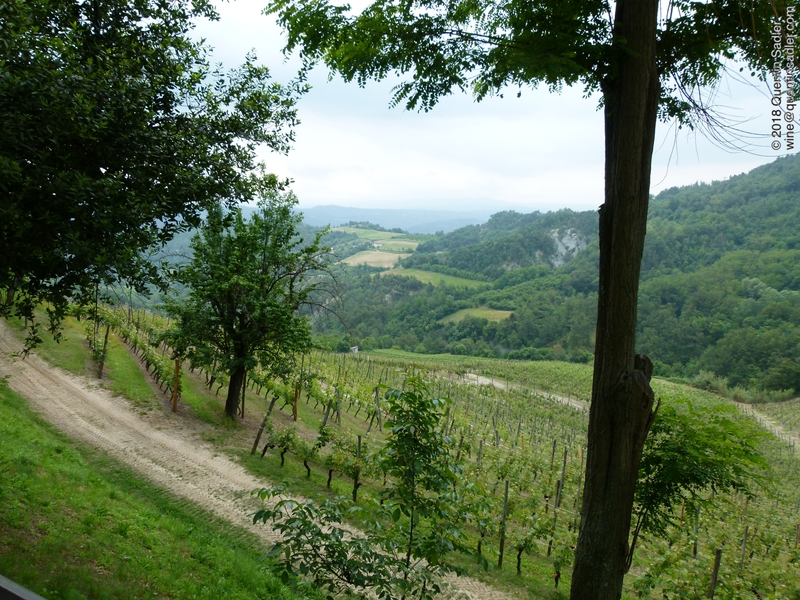 DNA testing in 2009 showed that the Nebbiolo used in this crossing though was actually Nebbiolo di Dronero. Dronero is in Piemonte, on the Po some 40km south west of Turin and 20km from the French border, this grape is not actually Nebbiolo at all, but a rare French grape from Ardèche in the Auvergne-Rhône-Alpes region of France. By the way consumers often find this sort of thing mystifying, but actually until very recently grape varieties were pretty unimportant. Historically people just grew what they had always grown and as they didn’t travel they gave it their own local name and remained unaware that the same grape grew elsewhere with a different name. Pretty much every grape variety has a whole raft of names in fact. It is simply that the mass communication and world-wide trade of the last 40 years has meant that it is better to standardise names of grape varieties so that people know what they are getting. It’s a bit like EU regulations if that is not too political a thing to say! It is fair to say that Albarossa has not really taken off as a grape and there are only four producers and just ten hectares planted in the whole of Italy, but if they all make wines like the one that I tasted then there should be more – a lot more. 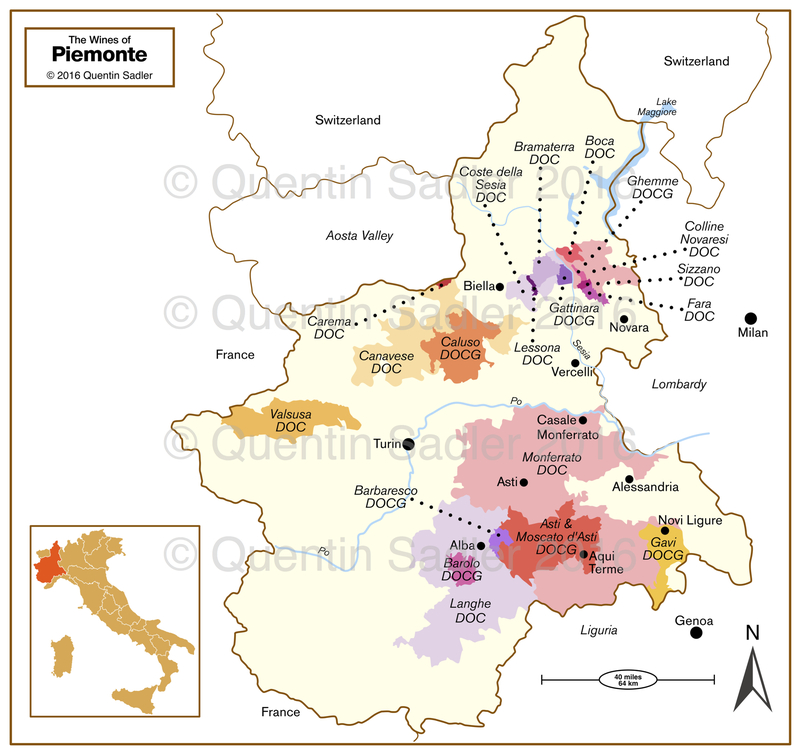 Wine map of Piemonte – click for a larger view. Banfi Piemonte is just a few kilometres east of the the lovely townof Acqui Terme in Alessandria province. Non watermarked, high resolution versions are available for a fee. The beautiful hills around Strevi. Castello Banfi are famous as a Tuscan producer where they craft magnificent Brunello di Montalcino in their hilltop castle and much else besides. Their estates in Piemonte are not so well known, but on this showing they really should be. It is based in the lovely little town of Strevi, in Monferrato, and has been making wine since 1860 in fact. Banfi bought it in the late 1970s not long after the creation of Castello Banfi in Tuscany. In Strevi they farm 45 hectares and make a wide range of wines including traditional method sparklers and a wonderful sweet sparkling red Brachetto d’Aqui that is superb with light chocolate desserts – click here. This is 100% Albarossa, one of only four such wines in the world, aged for 12 months in French oak barriques. Oh my this is a enticing wine with a beautifully opaque plum colour, lifted aromas of cherries, plums and redcurrant – that show its Barbera heritage. On top of that is fresh earth, fragrant vanilla, light mocha and spices. The palate is seductively soft, velvety smooth and round with lovely weight of concentrated fruit making it full-bodied and full-flavoured, but the freshness really shines through making it feel lively and balanced – the Barbera again? Rich plum, cherry, coffee, chocolate, some earth and leather and a creaminess to the texture all make this complex and joyful. The tannins are sinfully soft and the whole thing is utterly, utterly delicious – 92/100 points. The rolling hills around Acqui Terme. I tasted this wine the other week with my first Christmas dinner of the year – really. It was a perfect match with everything you expect in a classic British Christmas dinner and was so drinkable. There was a largish group of us there tasting all sorts of different wines with the Christmas dinner, but this was widely thought to be the best match. Available in the UK at around £18.99 per bottle from Noel Young Wines, Quaff Fine Wine,Weavers of Nottingham, Wined Up Here, Hedonism Wines, Tannico.co.uk. 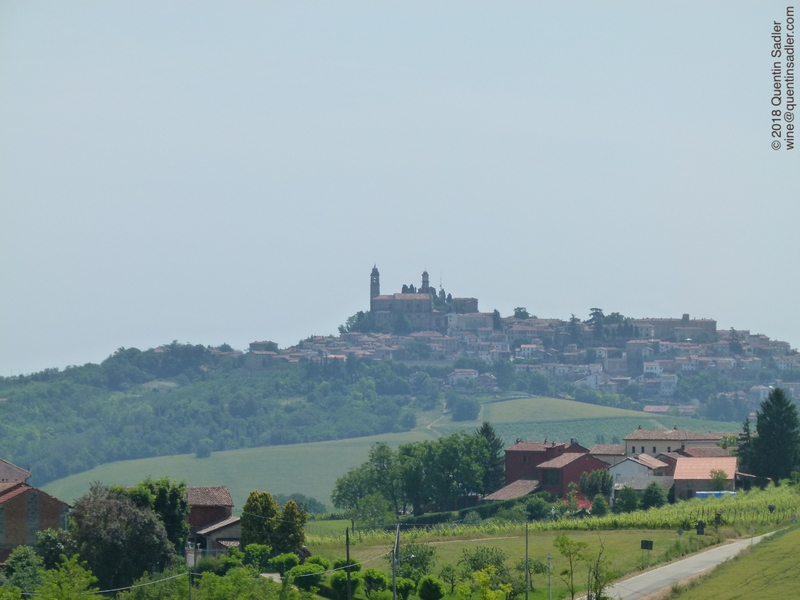 Posted in Comment, Italy, My thoughts, My view, Piemonte, Red wine, Wine, Wine of the Week, Wineries, Wines by country, Wines by style	Tagged Albarossa, Aqui Terme, Banfi, Banfi Piemonte, Castello Banfi, La Lus, La Lus Albarossa, Monferrato, Piemonte, Piemonte DOC, Piemonte map, Piemonte wine, Piemonte wine map, Strevi, what to drink with Christmas dinner?, what to drink with Thanksgiving dinner? A bottle of Duck and Crutch together with some of the botanicals used to make it. I don’t drink many spirits as I am – strangely – a bit wimpy about alcohol. So the only spirits that I do enjoy are those that we drink long with mixers, especially Campari and …gin. Gin is my favourite drink that isn’t wine or beer and to my mind it is utterly perfect in the late summer and into the autumn. Over the years I have tasted a great many gins, but have kept to a few brands that I like – for me gin has to be aromatic and flavoursome – and not paid too much attention to the current gin revolution I am afraid – the exact opposite of how I want people to be with wine! So, apart from the odd taste of something new now and again, the gin revolution of recent years has passed me by – which is a shame as there are such exciting gins out there. My new favourite gin appeared in my life entirely by chance because my sons both know one of the people who makes it. It’s called Duck and Crutch and it is the most wonderfully artisan product imaginable. George and Hollie are the passionate team who make it and the inspiration came from a distilling experience to celebrate Hollie’s 27th birthday a couple of years ago. Hence the name, as Duck and Crutch is apparently the bingo call for 27. It seems that experience led on to experiments at home with a copper 5 litre pot still, called Bunny, lots of vodka and different botanicals. Botanicals are the things that flavour gin by being put in a pot still with the base spirit, thus infusing the finished spirit with those tastes. Juniper is, of course the most important and famous botanical. The next step was to go commercial, but really that is hardly the right word as the whole set up is barking – even though it is actually in Kensington. For a start it is just George and Hollie doing the work and it is made in a shed. 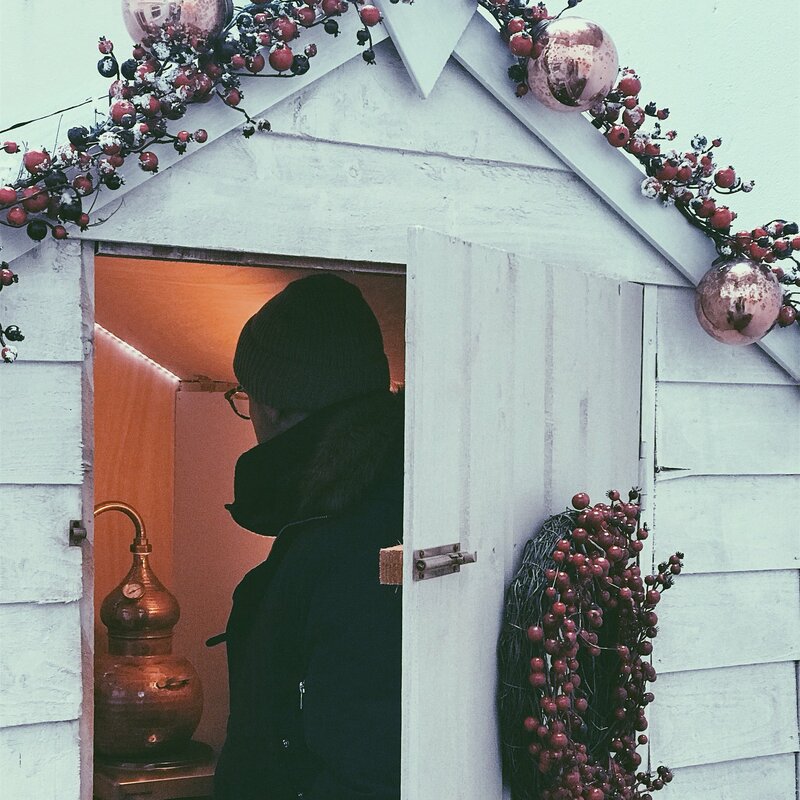 What’s more it is a tiny shed, smaller than a double bed in fact, but as with any man George thoroughly enjoys the time he spends in his shed getting the gin just right. Everything is done by hand, literally everything as the shed does not even have plumbed water. George preparing the botanicals for Duck and Crutch gin. They eventually graduated to a larger, 40 litre, copper pot still called Agnes and are now able to produce a grand total of 42 bottles at a time. 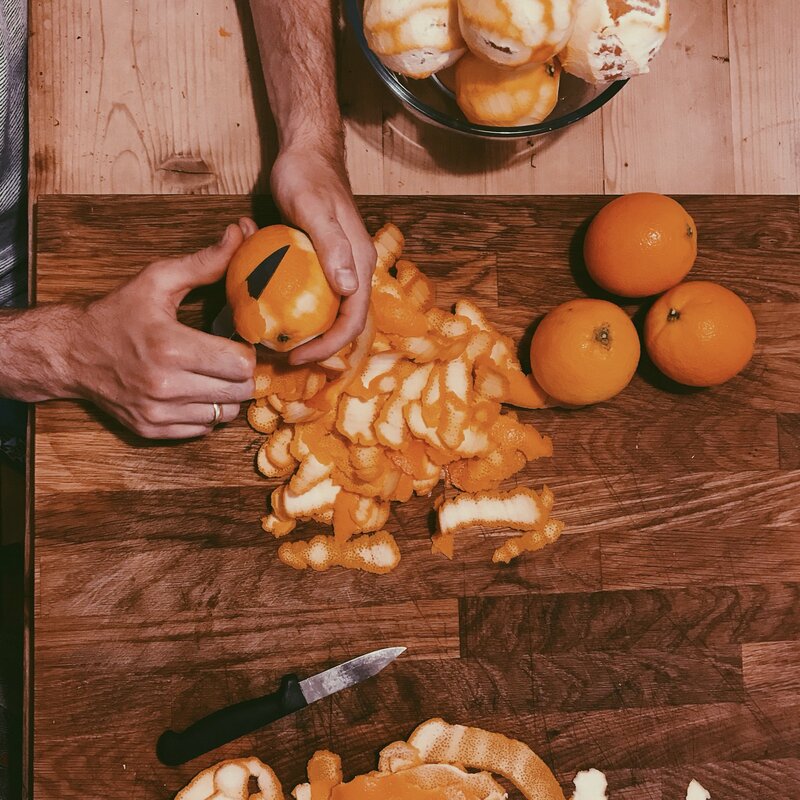 It seems that Hollie and George love Indian food and some of the inspiration for the flavours of their gin came from that passion – and it shows. They start with a neutral grain spirit and then add the standard botanicals like coriander, angelica and citrus peel, but most importantly juniper. To these they add the more exotic, signature botanicals of Darjeeling tea, Bourbon vanilla, fresh thyme, fresh lemon, walnuts, nutmeg and cardamom. You can really see the the Indian influence, which is only fitting as it was there that the very British love of Gin and Tonic started during the days of the Raj. All this love and care has produced a gin that oozes class and distinction. It is powerfully, yet elegantly aromatic with bright citrus notes, an enticing touch of smoky tea, some floral aromas, the warming spice notes of nutmeg and a deft background character of juniper and vanilla. The exotic Darjeeling flavours dominate the finish but are nicely balanced by the cut of citrus. I do not often drink neat gin, but I did try this and the concentration of the flavours is quite amazing. I would not want to drink much of it neat, but it was fabulous, heady but smooth and strangely moreish. Served, as God intended, with ice, lemon and Fever-Tree tonic the aromas explode onto your senses as though reinvigorated and concentrated. The flavours become more playful and refreshing, yet they are all still there – just as when you add water to Whisky. This is serious gin, rich, rewarding and refreshing and I recommend it most highly. What’s more Hollie created the brand and the look of the product and what a look it is. 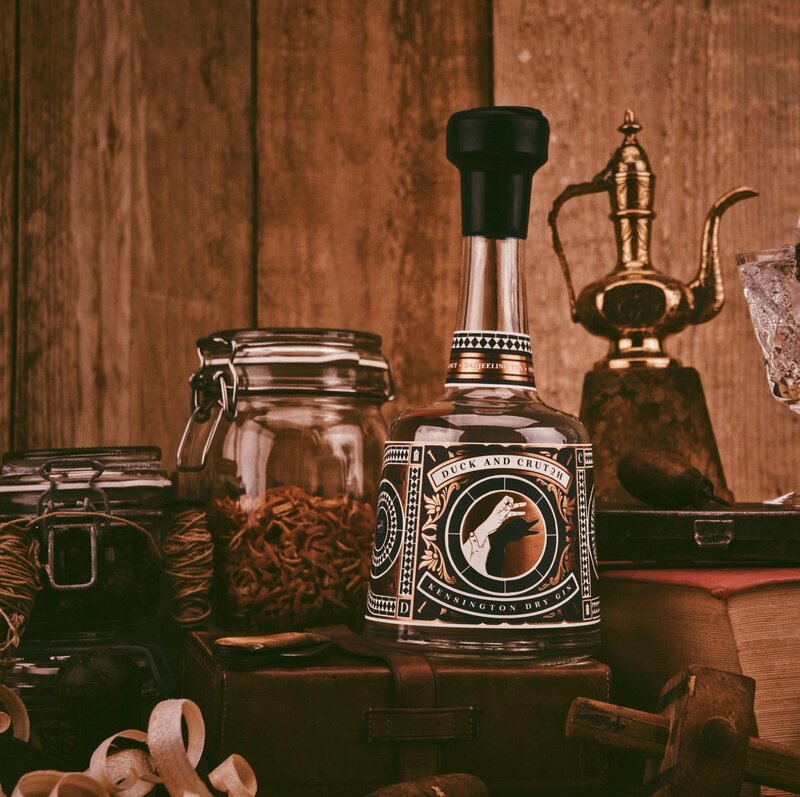 Duck and Crutch comes in a stunning bottle that is very tactile and attractive, while the label is a little work of art. I often get upset about the state of the world right now, but a Duck and Crutch with tonic seems to calm me down and makes me think that a world with such a wonderful gin in it can’t be all that bad – can it? Duck and Crutch gin is available from Jeroboams, Harvey Nichols, Gin Kiosk, Craftr and from Duck and Crutch themselves. Les Freses de Jesús Pobre. Spain never lets me down. I love wine from all around the world and am passionate about wines from everywhere and about the countries and regions that spawn them, but I always return to my first love – Spain. I am only in this business because of my misspent youth in Spain and the healthy relationship – I hope – that gave me to alcohol. It certainly made me like wine, but I am not sure that is entirely the same thing. Over the years I have seen huge changes in Spanish wine. Once upon a time only the reds were really good and even then only from one or two regions – principally Rioja of course. During my 34 years in the wine business the wine revolution has spread out throughout Spain and produced startlingly good results. Rioja has got better and better and high quality reds are now made in more and more unlikely places and the reds of the south are now at least as exciting as the more traditional regions of northern Spain. Look out for red wines from Valencia and Utiel Requena made from the Bobal grape and wines from Alicante and Jumilla made from Monastrell – aka Mourvédre and Mataro. Torres led the way with modern whites in the 1960s and ’70s and today the white wines of Spain are amongst the most exciting of all. Galicia, Rueda and Rioja all make world class white wines today, but so too do some much less well known areas like Terra Alta in Catalunya which produces blindingly good Garnacha Blanca / Garnatxa Blanc / Grenache Blanc. Albillo is making some stunning white wines in Castilla y León, while Merseguera is the white grape to watch in the Comunidad Valenciano, especially Alicante. One of the really lovely things that I have noticed in Spain in recent years is the way passionate people are training as winemakers, working in the industry for a while to gain experience and then buying or renting small parcels of vines in order to craft very personal wines. These projects are really thrilling and you can see them up and down the country, budding winemakers nurturing forgotten vineyards and coaxing them back to life – or sometimes planting them from scratch – and producing wonderfully expressive wines. The classic examples of course are Enrique Basarte and Elisa Úcar’s Domaine Lupier in Navarra and Charlotte Allen’s Piritia in DO Arribes on the Western fringes of Castilla y León, but such micro-wineries can be found everywhere and they often give interesting impetus to regions that in the past have often been very over reliant on the local cooperatives. In much of Spain from the 1940s onwards big production was the thing, so the cooperatives churned out huge volumes of palatable – by local standards – wine to slake the thirst of local workers with almost no regard to quality as we would understand it today. All that is changing of course, but anything that can help that is all to the good and the creation of new, quality focused estates even in unlikely corners of Spain can only help. The view from the family home, Casa Tranquilla – photo by Hilary Sadler, my brother. That mountain is the Montgó, you will note that we can see the sea between the land and the sky. Las Freses is perhaps half a kilometre round the terraced hill in the foreground, behind and to the left of the tree in the front and centre of the photograph you can just about make out the road that curves around to the crossroads. I have family in Spain so visit rather a lot. Indeed my family have had a holiday home in the Xàbia, or Jávea, area of the Comunidad Valenciana since 1965, the year I was born and the year that I first went to Spain. Initially we had an apartment on the Arenal, or beach area, and I well remember standing on the balcony and looking out at orange groves and vineyards as far as my eyes could see. Today all you see is more blocks of flats – thankfully for the view they are all low rise. In the early 1970s my father had a villa built near the tiny village of Jesús Pobre some 12 kilometres or so inland and that is where he now lives. Map of Spain’s wine regions. I have marked Javea and Jesús Pobre. Last week was my father’s 91st birthday and so I popped out to help him celebrate. Just around the corner from our house – and down a very steep hillside – is a crossroads. When I was a boy that crossroads was in a deep pine forest. As more and more villas were built, more and more land was cleared for more building, so the pine trees were cut down on our side of the road with a view to putting up some villas. Things move slowly in Spain and permission was not forthcoming, so as a stopgap the owner turned the land into a strawberry farm, which it remained for many years. In the meantime there were quite a lot of vineyards around that grew Moscatel – Muscat – to produce the local Moscatel de la Marina, – also see here – a lightly fortified Muscat made from overripe and partially dried grapes. Slowly people lost the taste for this wine and the vineyards often fell into disuse, almost never grubbed up, but abandoned. Les Freses complete with the Montgó and all that remains of the pine trees behind. A few years ago the land around our village was declared agricultural land and no new building is permitted. 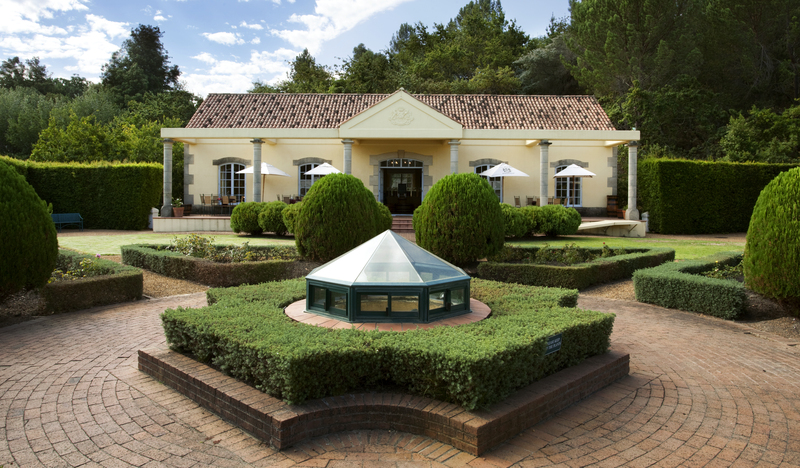 The owner could no longer develop it and sold it to Mara Bañó who from 2009 has transformed it into a vineyard. She has also built a beautiful and superbly equipped micro-winery – I have seen smaller, but not many – that is just full of the most wonderful new equipment and made me itch to have a go at winemaking. In order to show continuity with the past Mara named her new estate and winery Les Freses de Jesús Pobre. I assume that les freses is the Valenciano word for strawberries, but Valenciano is usually the same or similar to Catalan and I understand that the Catalan word for strawberries is maduixes – so who knows. I had wanted to try the wines ever since I heard about them, so dropped in and had a chat with Mara and tried all her wines that were available. What I found amazed me. This area has no real tradition of producing quality wines at all and almost no tradition of producing dry wine, yet here were world class wines being made in a place that is never mentioned in any of the wine books. As you might expect from a small estate made in a dry place by a young and passionate wine maker, these are “natural“ wines grown organically, fermented spontaneously with the wild yeast and have as little intervention as possible and as little sulphur used as is possible. Mara does grow some black grapes and so a red wine and a rosé are in the pipeline, but the focus is the whites for the moment, which I think suits the region, its food and climate. Given their diet – this near the coast anyway – it is strange how resistant the Spanish have always been to white wines. They even have a saying “si no es tinto, no es vino“, which means if it isn’t red then it isn’t wine and until very recently they lived by that. Nowadays the sheer quality of Spanish white wines seems to have broken that down somewhat and they are beginning to stock pretty good ranges of white in the shops and supermarkets. Even my favourite restaurant in Valencia, which used to only list 1 white wine, compared to 25 reds, has now greatly expanded its offering. Young wire trained vines at Les Freses with the Montgó behind – photo courtesy of the winery. Mara only grows one white grape at the moment, the traditional Moscatel de Alejandría – Muscat of Alexandria – but she makes three very different wines from it. The estate forms a single, triangular shaped block on the lower, very gentle slopes of the iconic Montgó mountain which rears up very near our house like a huge squatting elephant. It rises to 753 metres above sea level and dominates the area. It runs west to east, so vines on its south face sit in a perfect sun trap. The soils are pretty rocky limestone with rich red clay too. 100% Moscatel, harvested by hand and sent to the sorting table for a rigorous selection and manual destemming. Spontaneous fermentation in stainless steel, with its own yeasts and then aged for 4 months on the lees in 54 litre glass demijohns – that is very traditionally Spanish but usually only seen for rancio wines and dessert wines. This is the standard wine from the estate and it is very appealing, lively with lifted notes of peach, peach skin, almonds and sea salt. The palate is pristine, salty, mineral and ever so slightly smoky – those lees? – with a silky texture, taut peach and succulent grape flavours, enough acidity and freshness to balance it and that saline touch on the finish. Perfect with sea bass and much else I am sure – 90/100 points. It is at this point that I should admit that I generally avoid dry Muscat wines. I do not like it as a grape generally, finding it cloying, flowery and low in acidity. That being said I loved this, it really worked and I drank it all up! Bush vines at Les Freses. This is the top dry white from the estate with a careful selection of the best fruit and then fermented in a big tinaja, which is like a big earthenware pot like a Qvervi in Georgia. They are very traditional in Spain and were widely used up until the 1970s/1980s. In those days they were usually buried in the ground and fell out of favour because they were usually very old and hard to clean so spoiled the wine in many cases. Nowadays they are much better made and easier to clean. The nose is less vivacious and more dense but with lovely notes of almond and delicate orange. This wine is much more about the palate and is more concentrated with a gorgeous silky texture that flows very attractively across your senses. There is dense stone fruit, the acidity feels more vibrant, there is a twist of orange peel, those almonds are toasted this time. It has that salinity and a tangy, vibrant feel that balances the viscosity and richness. This wine is amazingly intense and fundamentally dry, but the intensity of the fruit almost makes you think it is slightly sweet – so it feels sort of sweet and sour. A great wine – 92/100 points. I actually do not know how this wine is made. It is not fortified, or doesn’t taste it anyway, so I think the grapes are late harvested and slightly dried. It has a lovely golden caramel colour with aromas of light raisins, dates and figs, rich nuts, buttery caramel and orange peel. The palate is sweet without being cloying. Caramel, creamy orange, fig, cinder toffee, intensely ripe apricots and fleshy peaches all swirl around the palate. A touch of bitterness and sweet spice keeps it balanced and accentuates the complexity. A stunning dessert wine of great class and complexity – 93/100 points. The carob tart that I enjoyed with the Les Freses Dolç in Pedro’s, the main bar and restaurant in the small village of Jesús Pobre. I had never tasted carob before, except for nibbling on the beans plucked from the trees growing around our house when I was a boy, it was very good and perfect with the wine. These are wines of the highest order, yet made quite casually by a single passionate person. They are produced in a place long written off by the great and the good of wine production and because they come from my spiritual home I was pretty emotional about them and more delighted to taste them than you can imagine. Do try them if you get the area – and I know lots of people do – you can buy them at the winery and in the local wineshops – such as this one: Vins i Mes, but not supermarkets. Many of the local restaurants – including Pedro’s – have them too. I was put in mind of this quote by Matt Kramer the American wine writer: “The greatest wines today are not, paradoxical as this may sound, the so-called great wines”. The wines that excite me most and give me the most pleasure often come from the unlikely corners and forgotten places. 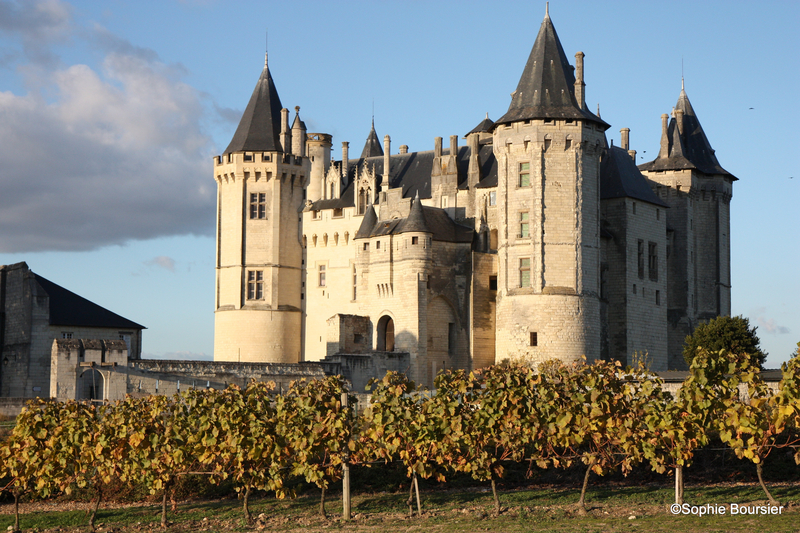 Vines in Saumur – photo courtesy of Bouvet-Ladubay. I do enjoy a nice bottle of fizz. At any time really, although it seems even more pleasurable in the summer. There’s something wonderfully hedonistic – and a little bit naughty – in enjoying some pink fizz whilst idling away time in a garden, in the summer. Such a moment is about pleasure and sharing and so the wine itself can take a back seat. It does not have to be something fine or rare, just something that will deliver pleasure to everyone there, ease the conversation and allow them to enjoy that moment. The other day I tried a sparkling rosé from France’s Loire Valley and it provided just such a moment. In fact I enjoyed it so much that I have made it my Wine of the Week. Vines at Château de Saumur, photo courtesy of Bouvet-Ladubay. 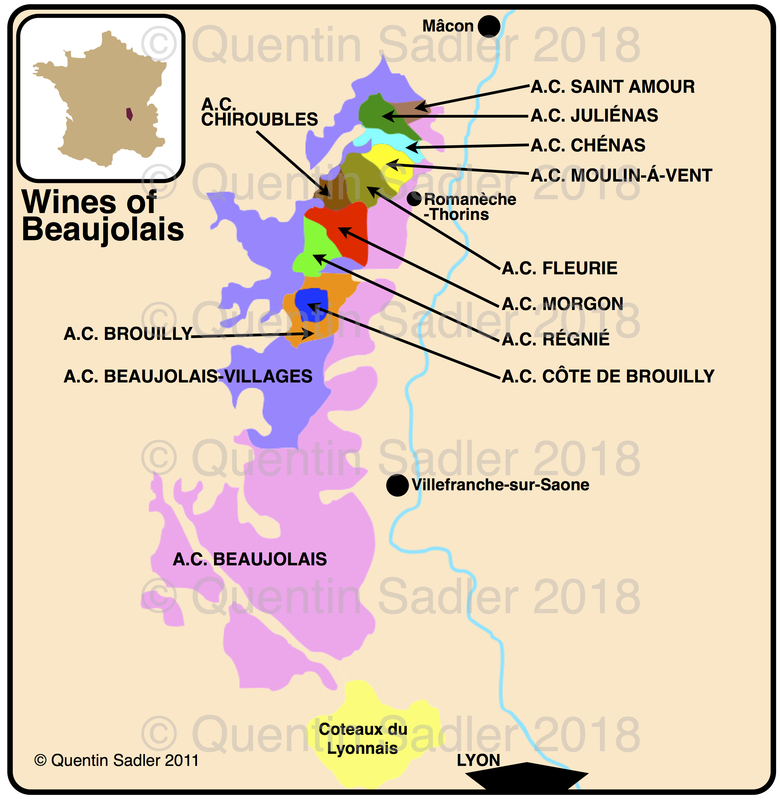 Wine map of the Loire Valley – click for a larger view – non watermarked PDF versions are available by agreement. Bouvet-Ladubay was founded in 1851 just at the dawn of the prosperous reign of Emperor Napoléon III and was the first serious producer of sparkling wines in the Loire. The company was created by Etienne Bouvet and his wife, Celestine Ladubay in Saint-Hilaire-Saint-Florent near the lovely riverside town of Saumur. The whole area is a warren of cave systems as stone was excavated from here to build the great Châteaux of the Loire. 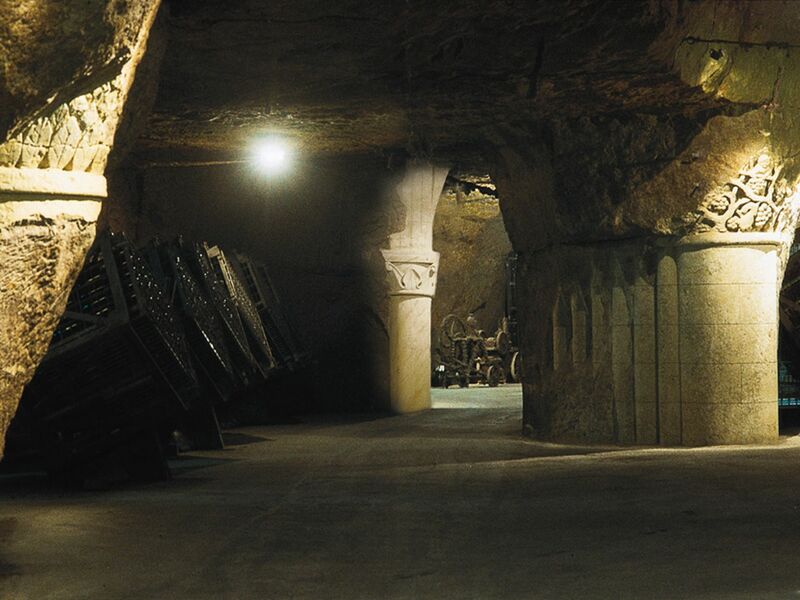 Etienne bought 8 km of these galleries to use them as cellars for ageing sparkling wine and enjoyed great success throughout the nineteenth century. Etienne died in 1908 but three quick successive deaths meant there were no direct heirs left to run the business and so it was eventually bought by Monmousseau in 1932. They owned it until 1974 when it became part of the Champagne Taittinger group who in turn sold it to Diagio before it returned to Monmousseau in 2015. 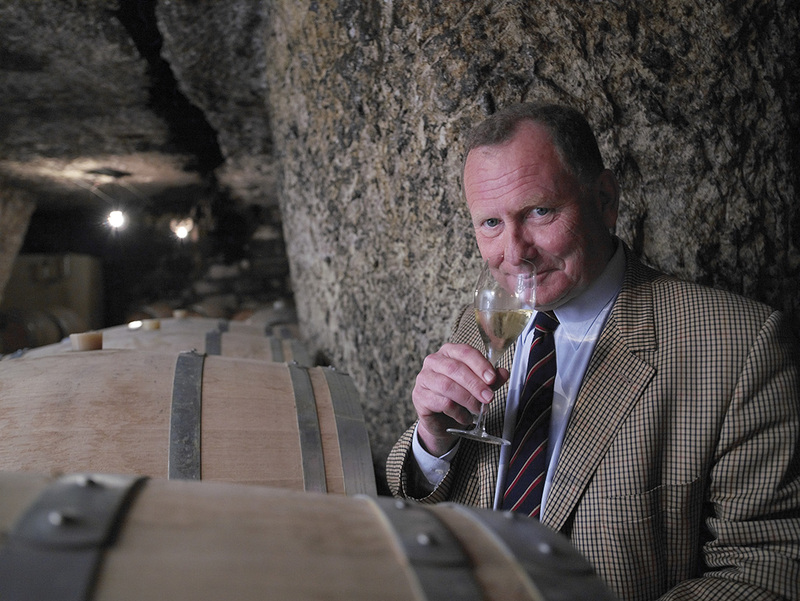 Patrice Monmousseau, Chairman and managing Director, in the cellars. They make something like 6 million bottles a year and everything that I have ever tried from Bouvet has been very nice to drink. This particular cuvées is made from Cabernet Franc – the main black grape of the region. The colour comes from a short maceration on the skins and the juice is fermented in stainless steel tanks. The parcels are then blended and bottled prior to the second fermentation and it is aged on the yeast sediment for two years before release. The wine has a slightly orange or onion skin colour, while the nose offers red-currants, toasted pine nuts and orange peel notes. The palate is soft and ever so slightly creamy with red fruits reminiscent of a summer pudding, a twist of citrus and a little spice. The mousse is fine and beautifully persistent. Who knows whether it was the weather, my mood, the company or if I was just thirsty, but I enjoyed this very much and the bottle emptied itself at an alarming rate. This is a lovely aperitif or partners almost any food from crisps and a cheese straw to fish and chips, Chinese, Thai or even some fancy fish or a barbecue – 88/100 points. Available in the UK at £12.99 per bottle from Majestic Wine Warehouses – and £9.99 as part of 6 mixed bottles. The Morgenhof Estate – photo courtesy of the winery. For a long time I have been of the opinion that South Africa has really got into its stride with Sauvignon Blanc and from a quality point of view is giving some other places some real competition. 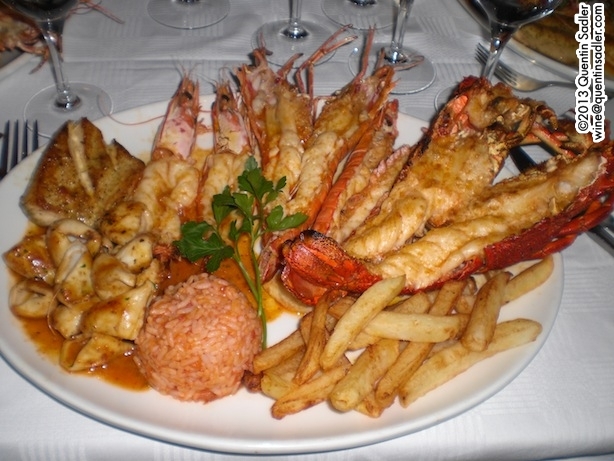 I love visiting South Africa’s Western Cape and have lots of happy memories there, some of which involve looking at beautiful views and eating amazing seafood washed down with some fantastic white wines, many of which are made from Sauvignon Blanc. Each time I visit I wonder why South African Sauvignon is not more popular and sought after. The reason I think I like it so much is that the wines are all thoroughly modern, but are bone dry and less tropical than others and sometimes, not always, that suits me very well as they are very food friendly. 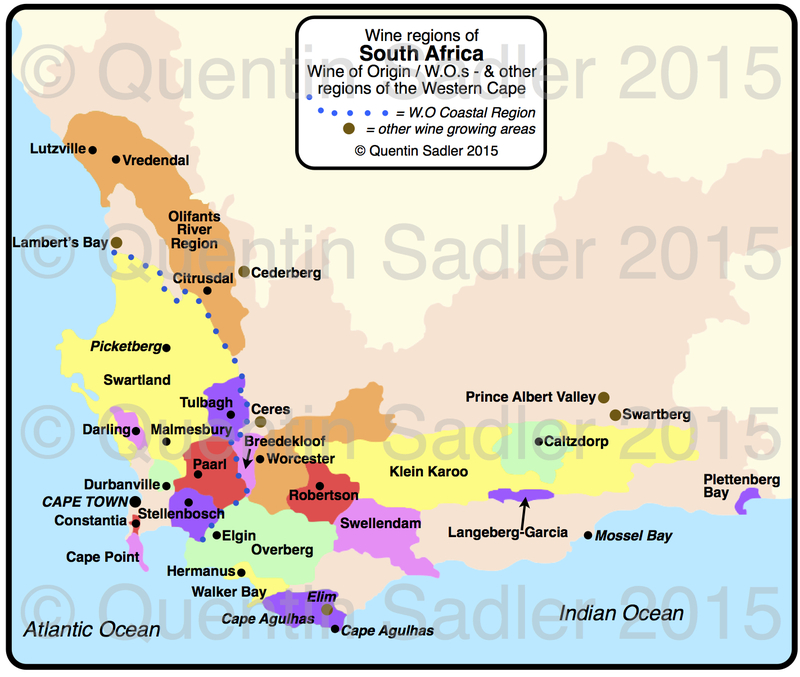 Good examples can be found from quite a few different wine regions of the Western Cape – South African wine regions are called Wine of Origin or WO on the label – including Durbanville, Constantia, Elgin and Durbanville, Constantia, Elginastal Region, which blends fruit from across a good few more famous regions. Well the other day I tasted one from Stellenbosch and it struck me that it was a perfect Summer wine – so I have made it my Wine of the Week. Wine map South Africa’s Western Cape – click for a larger view. Morgenhof is one of the great and venerable names of South African wine, having been founded in 1692. It is just a kilometre or so from the beautiful town of Stellenbosch, which is one of my favourite places, and the main building is a fabulous example of classic Cape Dutch architecture, while the whole place is a haven of tranquility. 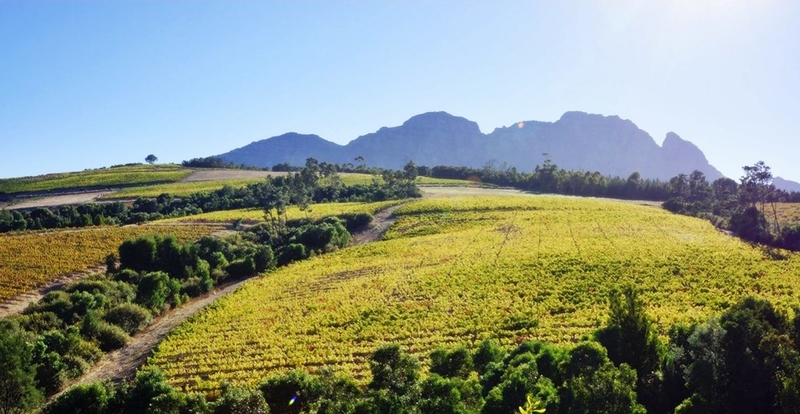 The estate nestles on the lower slopes of the dramatic Simonsberg Mountain and is stunningly beautiful, as is common in this amazing country. 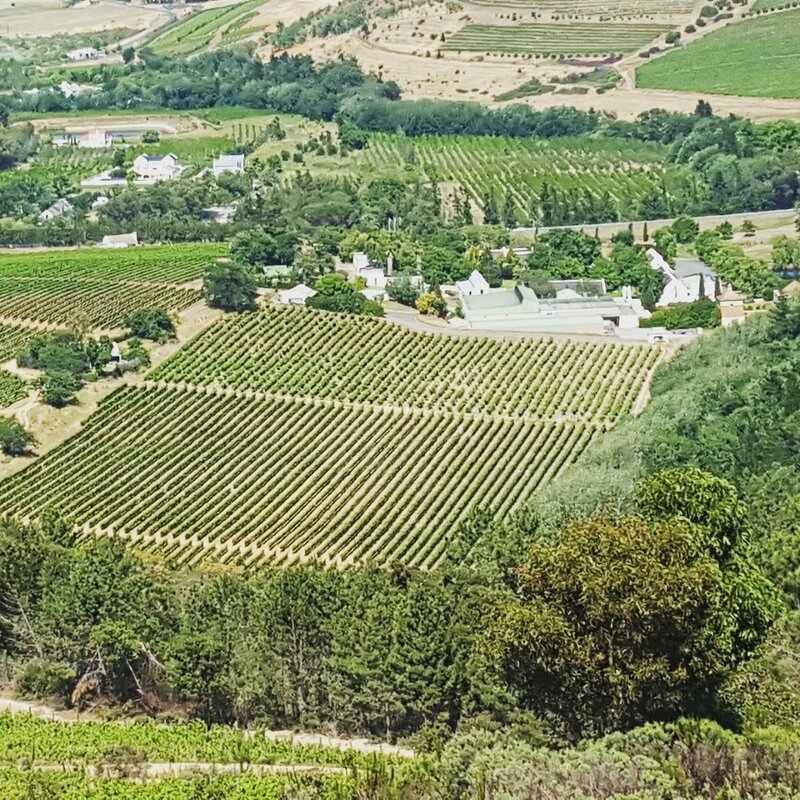 What makes the Western Cape so remarkable is that the soils, aspect and altitude change very quickly over a very small distance, which is why there are such diverse styles and such a huge range of grape varieties successfully grown. Morgenhof have 213 hectares, but only plant 78 of those with vines, the rest helps to retain biodiversity and the beauty of the location – they also host events and weddings. They dry farm without irrigation to ensure maximum flavour and concentration and the vineyards vary in altitude between 65 metres above sea level and 450 metres – so they can find somewhere to suit pretty much any grape and indeed grow Cabernet Sauvignon, Merlot, Chenin Blanc, Sauvignon Blanc and Chardonnay. The Morgenhof Estate looking down from some of the vineyards – photo courtesy of the winery. The Sauvignon is planted in two parcels, one is 30 years old at 180 m above sea level on a north-north west facing slope on stony, gravelly soils. While the other is about 10 years old and sits at 200-240 metres on a terraced south west facing slope. The grapes are picked in the cool of the morning, de-stemmed and the pulp has between 6-12 hours skin contact, which makes for a richer mouthfeel. 50% is fermented with the wild yeasts, which again enriches the mouthfeel. The fermentation is long and very cool at 9-11˚C, which retains freshness and acidity. The nose delivers lovely, classic aromas of a mixture of lemon and lime, gooseberry, elderflower, grass, some fresh green pepper, herbs, wet stone and a touch of the seashore. The palate has all those aromas as flavours together with some crunchy blackcurrant leaf, lots more lemon and lime and a lovely, gentle ripe creamy quality. The acidity is refreshing and high, but the wine is never tart. Instead it is balanced and cohesive with good richness, texture and fruit as well. Sauvignon Blanc is not always my favourite grape, but this is a lovely wine with great balance and poise. It is both delicate and ripe all at the same time and that tension makes it very stylish and very elegant – 90/100 points. This is incredibly versatile, utterly delicious and very easy to drink with food or without. I can see this will become my go to white wine this summer. Available in the UK for £12 per bottle from The Drink Shop.